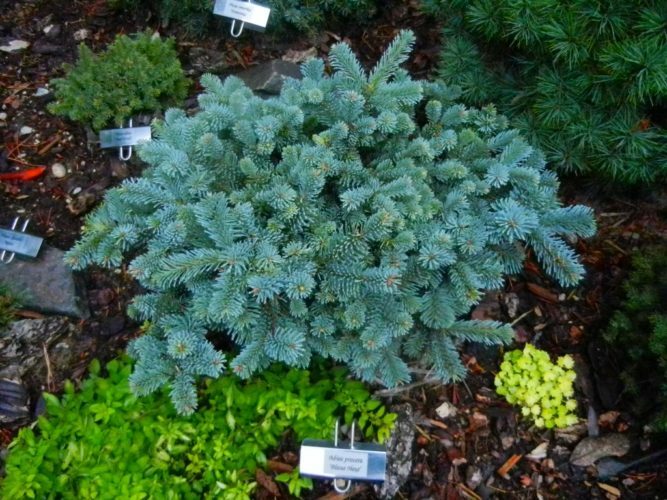 Abies procera 'Blaue Hexe' Blaue Hexe translates directly to 'Blue witch' in the German language. Used in context, however, Hexe is an abbreviation of 'Hexenbesen' which is 'witch's broom' in German. Therefore, Blaue Hexe figuratively translates to Blue Witch's Broom. 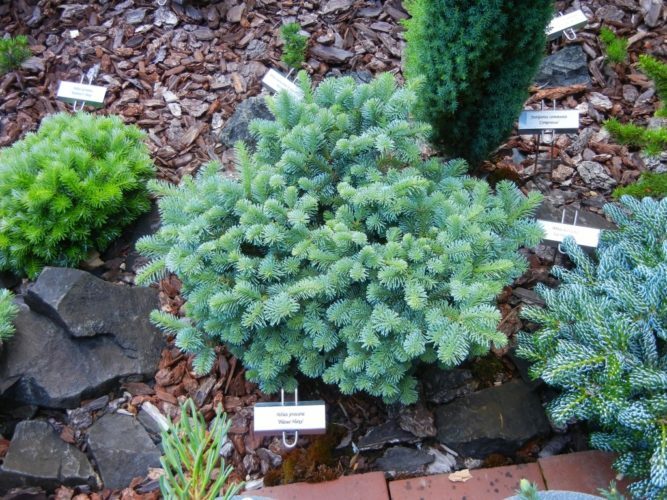 This cultivar is one of the most desirable dwarf Noble firs available. The needles are bright powdery Blue, arranged with an attractive curl. Typical rate of growth in most areas is 0.5 to 2 inches (1.2 - 5 cm) a year, resulting in a flattened globe, 8 inches (20 cm) tall by 18 inches (45 cm) wide after 10 years in the landscape. Normally the growth habit is globose, tight and spreading, but older specimens have been observed to form a leader and eventually become a squatty upright growing dwarf conifer. 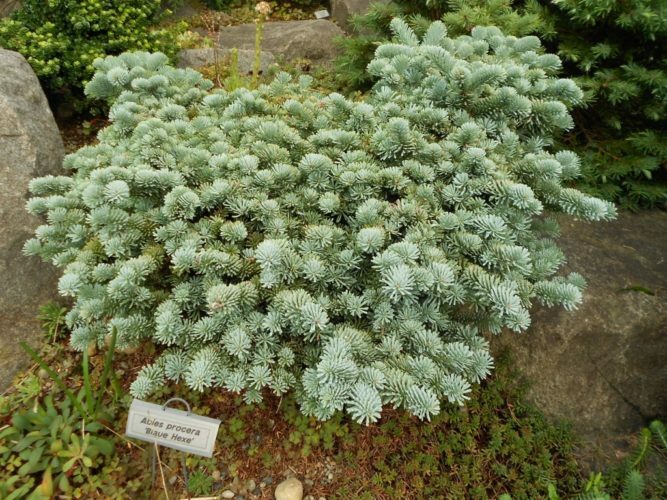 Boehlje Nursery of Westerstede, Germany, first introduced 'Blaue Hexe' in 1965. It should be noted that this is one of the more finicky conifers to establish and have thrive. 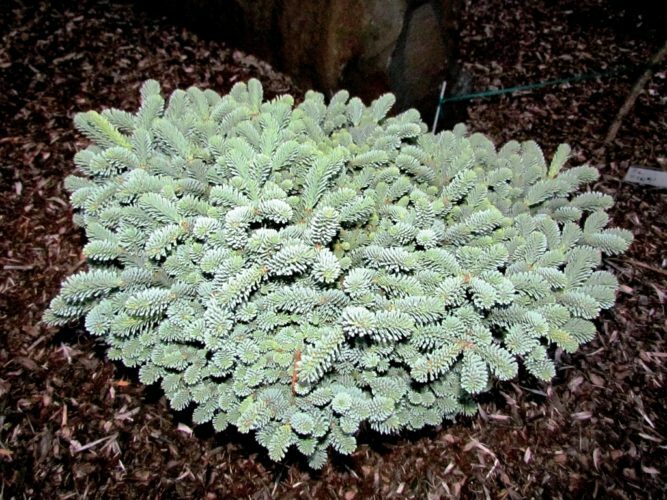 Since A. procera comes from high elevations in the western U.S., it is ill-adapted to excessive heat and humidity, especially at night. This specimen is about eight years old, photo from early Summer, Hobbiton Gardens. Photo taken in Autumn, 2013 in Hobbiton Gardens. This specimen gets full sun and has a great compact form. Photo from Hobbiton Gardens, 2013. Pictured is a nice old, healthy specimen of Abies procera 'Blaue Hexe' featured at Glacier's End Arboretum in Olympia, WA. When this photo was taken in 2013, this specimen was 12 years old, measuring 10 inches tall by 12 inches wide. 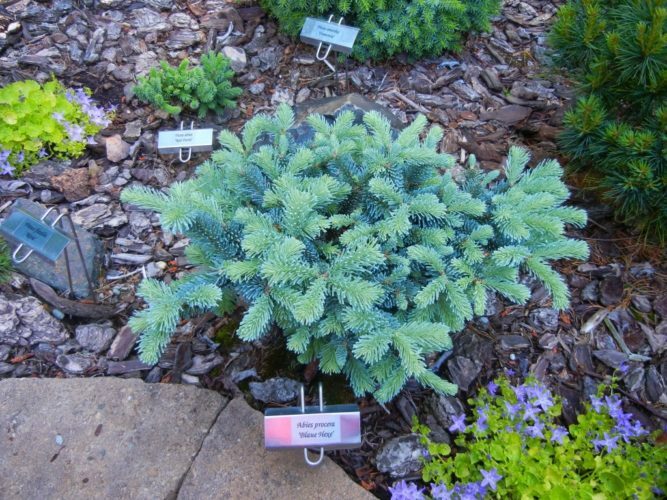 Abies procera 'Blaue Hexe' — an exceptional specimen at Cox Arboretum, Canton, Georgia.